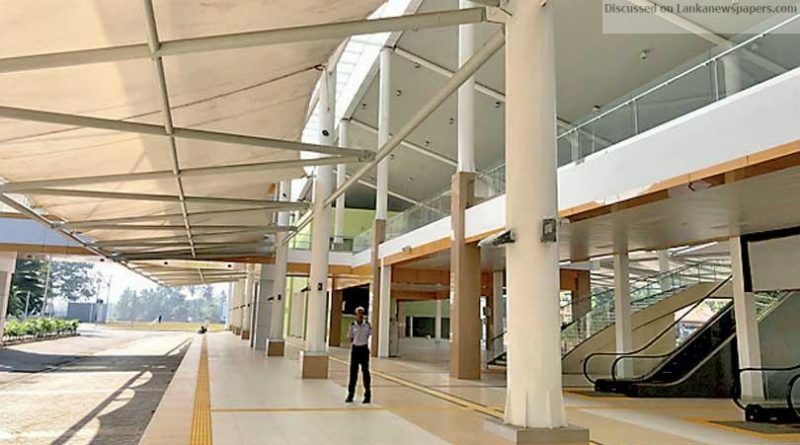 The Kottawa-Makumbura Multimodal Transport Centre – the first of its kind in Sri Lanka providing seamless access for passengers to connect among transport modes, is to be declared open tomorrow (March 31) by President Maithripala Sirisena, with the participation of Prime Minister Ranil Wickremesinghe, Ambassador of Japan to Sri Lanka Akira Sugiyama, Minister of Megapolis & Western Development Patali Champika Ranawaka and officials of Japan International Cooperation Agency (JICA) and Government of Sri Lanka. The Multimodal Transport Center (MTC) links the Maalapalla station – the terminating railway station of the Kelani Valley line, with short and long distance buses routed via Makumbura and expressway buses plying on Southern Expressway and Outer Circular Expressway. It will enable passengers to change between bus and train services in safety and comfort, and reduce overall travel time. Located just at the entrance to the Kottawa Expressway Interchange, it will also facilitate private vehicle users on the expressway to park and ride on public transport to the city center. Once Phase III of the Outer Circular Expressway is completed, the Kottawa MTC will provide connectivity to the Katunayake Expressway and Airport as well. The construction and equipment for the Transport Centre were financed partially through JICA’s Official Development Assistance loans for the Outer Circular Expressway, and remainder through treasury fund of the Government of Sri Lanka. The Ministry of Megapolis and Western Development implemented the project as part of its Township Development Component, and will be responsible for operating the facility as well. The MTC has been designed prioritizing passenger comfort and convenience, with air-conditioned waiting rooms with comfortable seating, enclosed corridors to move between transport systems, LCD display system to provide on-time information on bus and train movements, and rest and recreational facilities. Necessary facilities for safe and comfortable access to disabled persons have been incorporated in to every aspect at the MTC. The facility was designed focusing on energy efficiency and environmental considerations as well. Solar panels installed on the roof generate sufficient electricity for the operation of the entire facility. Interior is designed to let maximum daylight in, such that the need for artificial lighting is reduced. “We are happy to have contributed to the establishment of the first such Multimodal Transport Centre in Sri Lanka. We hope this will become a good example to other planned multimodal transport centres, and contribute to improve efficiency, comfort and safety for public transport passengers,” Fusato Tanaka, Chief Representative of JICA Sri Lanka Office noted. In addition to financing nearly 50 percent share of the operational expressways in Sri Lanka, JICA is currently financing the new Kelani Bridge at Peliyagoda and the first electric urban light rail transit line in Sri Lanka from Malabe to Colombo Fort.